80% of divorcees report knowing that their marriage was a mistake before they walked down the aisle. Relationship author Russell Friedman discloses the five most common thinking errors and behaviors that indicate that emotional baggage is keeping you stuck. 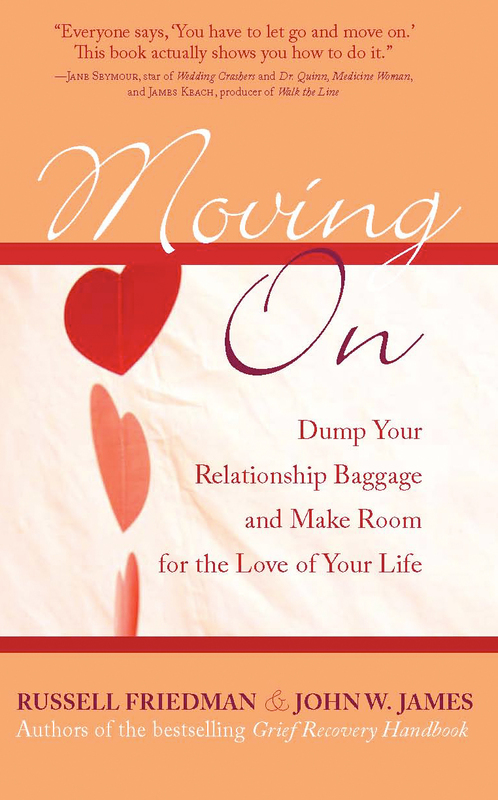 "It's impossible to make a marriage or other committed relationship work out when both partners drag along excess emotional baggage left over from prior romantic relationships," says relationship expert, Russell Friedman, co-author of Moving On -- Dump Your Relationship Baggage and Make Room for the Love of Your Life." "The divorce rate hovers at 50%, which is unconscionably high. But long-term relationships between unmarried couples, crash and burn at a much higher rate," says Friedman, "causing equal or greater emotional mayhem. The fact that there was never a formal marriage does very little to mitigate the emotional pain when the relationship ends." Friedman and co-author John W. James, are the principals of The Grief Recovery Institute. Over the past 20 years, they've gathered information from more than 25,000 people whose lives have been dramatically altered by relationship endings. Their two-decade investigation into the causes -- and remedies -- of relationship problems, led to some startling conclusions. In a recent interview, Friedman explained, "Without doubt, the major cause of divorce/break-up is that so many people enter romantic relationships without having taken any actions to deal with what was left emotionally incomplete in prior relationships. The by-product of leaving that emotional baggage unattended, causes a person to enter the next relationship a little less open, a little less trusting, and a great deal more fearful of getting hurt again. Those three elements alone are more than enough to sabotage any future relationships. A compounding fact is that by the time people are ready to 'settle down,' they've already had a few or several romantic break-ups. The negative impact of those break-ups is cumulative and cumulatively negative." Another result of their research was the staggering fact that 80% of the people who had been married and divorced, reported that they "knew" before they walked down the aisle, that they were making a big mistake. Friedman paraphrased thousands of the conversations he's had with grieving divorcées: "They knew this wasn't the right person for them to spend the rest of their live with, yet they walked down the aisle and into the inevitable waiting arms of a divorce attorney." You think the best way to deal with your broken heart is to "be strong"
You are using food or alcohol or other substances to try to cover up your feelings. The authors make it clear that overcoming emotional baggage requires that individuals to go through a process of self assessment and correction which is described in their book. The process involves discovery, examination, application of specific completion techniques and re-entering the dating pool and only dating others who have completed their past relationship issues or who have "dumped their baggage." Friedman cautions everyone to "Learn to trust their intuition in relationships" and exit those relationships that don't feel right quickly. Many people told Russell and John that they somehow thought their love could conquer any problems they might encounter in their relationship. But, love can't conquer a relationship past nor can it overcome the baggage a potential partner has accumulated along the way. "Each individual must go back and deal with the residue of their prior relationships or they are doomed to fail again. Obviously, it's best to do this 'before' you embark on a new relationship." Friedman adds, "But, if you're in a new relationship (or one that's got some time but is struggling), it's not too late for either or both partners to go back and deal with their pasts. We say, jump into the actions of Moving On. It's the best guarantee that a relationship that has possibility of success will really have a chance to make it."